On Sunday, May 22, 2016, the AIOC held a very successful Team Challenge Match in Nanaimo at Beben Park. Rally Obedience was again very popular with 14 teams entered. Obedience had 25 dogs entered.in the Obedience portion in all levels. 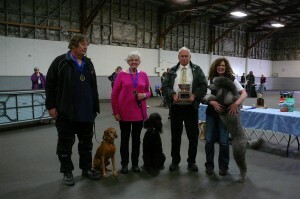 Thank you to our judges, Carol Toms for Rally, and Terry Gains for Obedience. Special thanks to ring stewards and timers for Obedience and Rally! All those contributing in their own way helped to make the make the day a success. The Raffle was a great success again, raising $546.00 thanks to all the Clubs who donated prizes, purchased tickets and manned the table selling tickets all day. Thank you to everyone who baked goods and mannd the concession table, lots of yummy treats were devoured! GVDOTC Treasurer, Mary Christian took great pleasure in awarding the 2015 Arlene Bishop AIOC Rally Trophy to Cathy Mawdsley with Odin with an aggregate score of 299 Rally Exc. B.
Terry Gains and Spice won the Hudson Memorial Trophy for 2015 with a score of 587! 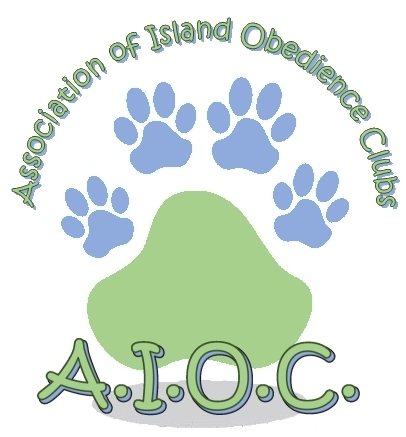 Fourteen teams of two handler/dog teams, working at different levels and representing 6 AIOC member clubs, competed for bragging rights and the coveted AIOC Team Challenge winner’s medallions. Congratulations to our Rally Team Challenge winners!! We had a total of 25 dogs entered on the day for the three categories. There was just one team competing this year from Forbidden Plateau. 1st Place team was from COWN with a score of 382. Team Members were Catherine Dunstan with Desi and Lynn Byers with Sophie. 2nd Place team was from FPDOTC with a score of 367. Team members were Wendy Wallace and Rumor and JoAnne McLeod with Cash. 3rd Place team was from GVDOTC with a score of 348. Team members were Ruth Schippers with Ace and Philippa Sloan with Stryker. 8 Teams competing and the winner were from COWN! 2nd Place from FPOTC with a score of 383. Team members were Lori Yarrow and Frida and Aldean Riddy with Polly. 3rd Place from COWN with a score of 344.5. Team members were Heather Roach and Gazza, and Rona Winterbottom with Eason. 4th Place from COWN with a score of 342 was Susanne Armour and Foghorn and Judy Duncan with Wylie. 5th Place from Lakewood with a score of 335.5. Team members were Janey Turner with Shea and Lea Hoffman with Maddie. 6th Place from NKC with a score of 333.5 was Maggie Henigman with Winkie and Carol Ann Greyson with Idjit. 7th Place from NOSA with a score of 303.5 was Nora Shandley and Clancy and Marissa Armstrong with Arnold. 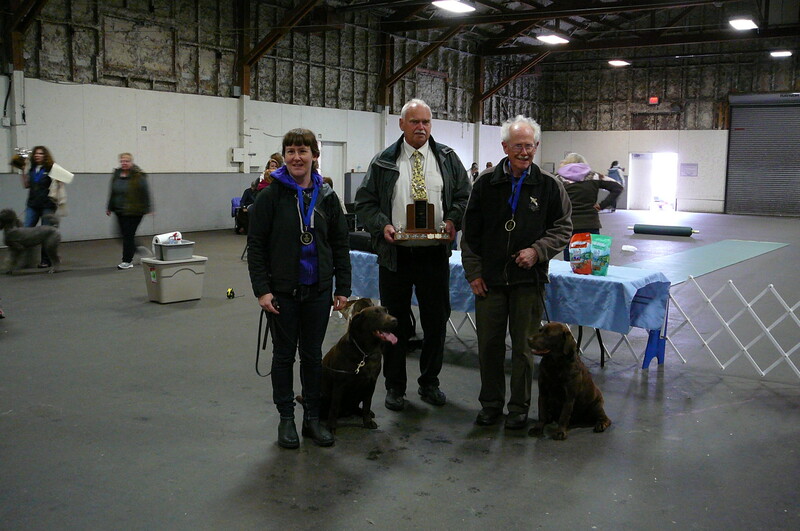 Congratulations to all the Obedience Teams that participated in this year’s event! Results for obedience were compiled by VIP Dog Club and reported by Leslie Gardiner. On Saturday, April 25, 2015, AIOC held a very successful Team Challenge Match in Nanaimo. This year, for the first time, Rally Obedience was included. Rally was very well received, with a total of eighteen teams competing. Obedience had thirty three dogs entered. Thank you to our judges, Carol Toms for Rally, and David Denis for Obedience. Thanks also to all the clubs and members who helped to make the day a success. Congratulations to all the winning teams, and to everyone who participated. Results of the First Rally Challenge. Eighteen teams of two handler/dog teams, working at different levels and representing 6 AIOC member clubs, competed for bragging rights and the coveted AIOC Team Challenge winners medallions. Participating member clubs included: Forbidden Plateau Obedience and Tracking Club, Cowichan Dog Obedience Training Club, North Saanich Dog Obedience Training Club, Campbell River Dog Fanciers Society, Island and Pacific Labrador Retriever Club and Nanaimo Kennel Club. Their aggregate score was 197, with a total time of 2:39:73. Congratulations to our first Rally Team Challenge winners!! We had a total of 33 dogs entered on the day for the three categories. We had 1 utility dog, 11 open dogs and 21 novice dogs. Greater Victoria Dog Obedience Club. Aggregate score of 358. Cowichan Dog Obedience Training Club. Aggregate score of 370.5. Cowichan Dog Obedience Training Club. Aggregate score of 390.5. Submitted by Ruth Bridges on behalf of the AIOC. With a total of 18 teams from 8 different clubs we had a full and fun trial. 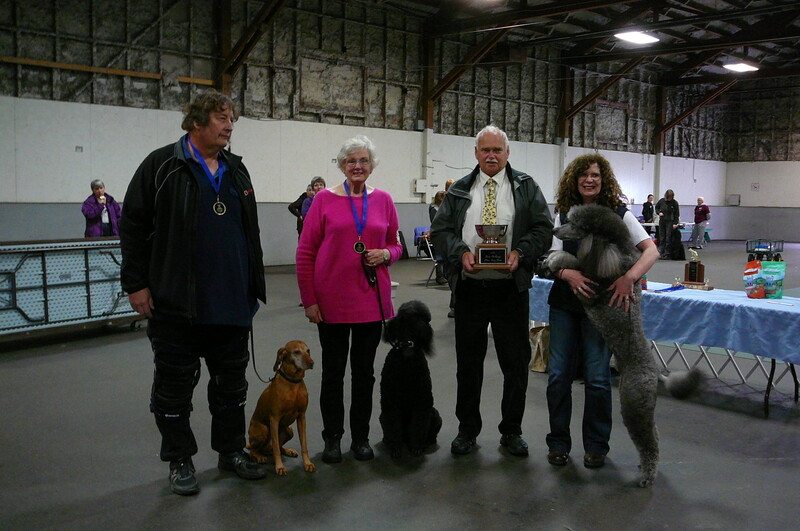 Thanks very much to the Campbell River Dog Fanciers Society for undertaking the registrations of all entries and tracking the totals of each team. Well done Ladies! The 2012 Team Challenge was hosted by all member clubs of the A.I.O.C. and held in Nanaimo on May 6, 2012. The challenge commenced at 9:30 am with Bill Blair judging all classes. Congratulations to Cowichan DOC Team of Catherine Dunstan (Desi) and Cathy Mawdsley (Portia) with a tied winning score of 385.5. “Thank You” to our Exhibitors and the many volunteers whose participation made this a fun and exciting event. Special Thanks to GVic (flyer), VIP (registration), NKC/AVKC (rings and equipment), FPOTC (concession), NOSA/IPLRC (raffle), Cown (ring stewards), Lkwd (trophy keepers), CRDFS (demonstration by the Island K-9 Freestylers and Rally Obedience trial) and to our judges Bill Blair (Obedience) and Carol Toms (Rally O).